396. 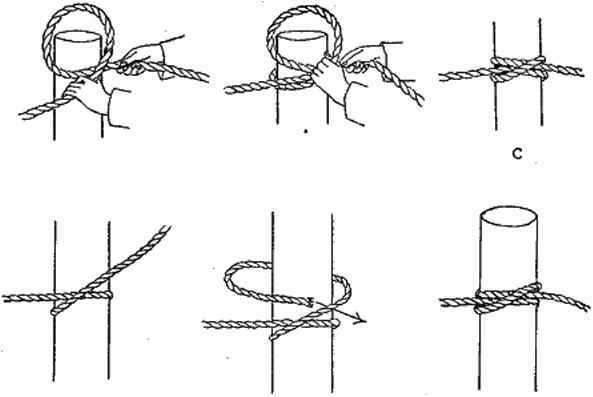 The weaver's knot or sheet bend (Fig. 334) is good for joining two ropes. It remains secure without drawing up tight and is easily untied. 396. The figure-8 knot (Fig. 335) may be used where a large bulky knot is needed on the end of a rope to keep it from drawing through a hole or through a pulley. 397. The bowline on the bight (Fig. 336) is used for forming a loop in the middle of a rope or near the end where it has been doubled. It is used as part of the tackle in casting horses. 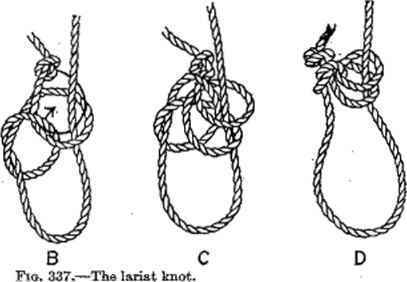 It is tied by forming a loop in the doubled rope and passing the doubled end of the rope through the loop. The doubled end, or bight, is then brought down and slipped over and back up around the loop and standing parts. from the end about a foot, and drawn up loosely. The end of the rope is then passed around the standing part and through the loop and a second time around the standing part and through the loop. 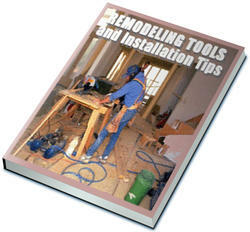 The knot is then finished by drawing the parts tight. Hitches are, in the main, quickly made temporary fastenings that depend upon the pull on the rope to keep them secure. 399. 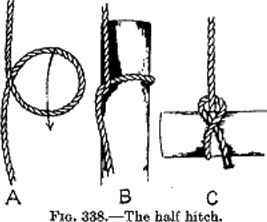 The half hitch is generally used in connection with other knots and hitches. 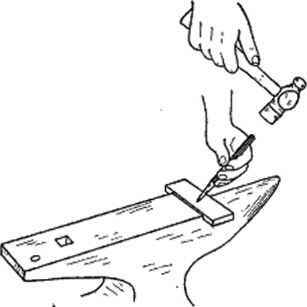 A half hitch ready to be put over an object such as the end of a post is shown at A (Fig. 338). A half hitch in the end of a rope is shown at C (Fig. 338). 400. The timber hitch (Fig. 339) is similar to the half hitch but is made more secure bjr wrapping the loose end once or twice through the loop. The timber hitch and half hitch are often used in combination for holding or moving logs. 401. The clove hitch is one of the most useful ways of fastening a rope to a post or stake. Two methods of making the hitch are illustrated in Fig. 341. Fig. 339.—The timber hitch. Fig. 340.--The timber hitch and half hitch combined.